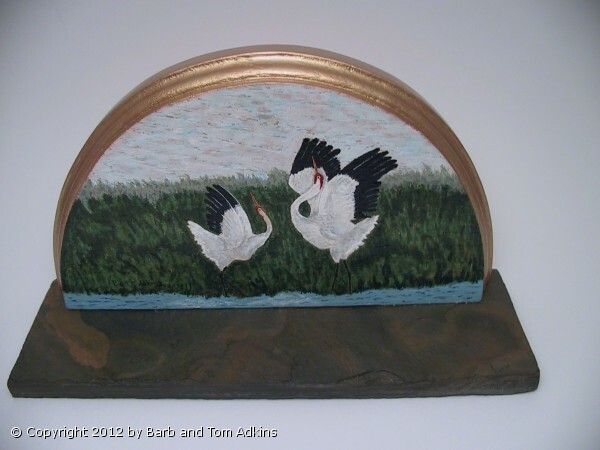 Each Bookend is a different painting of a pair of Whooping Cranes, jumping during their extraordinary Spring Mating Dance. Please notice in the picture below,the other bookend has the pair flying together just above the water. Using the Oak Board, gave me a chance to use the grain of the wood as the clouds in the sky. Endangered Whooping Cranes are the largest bird in the US. They live near water, in the Wetlands, eating small fish and crawdads. The gold rim is painted with 14 kt gold paint. The Bookends are quite heavy because the base in slate. They will support many books, large or small. The slate bottom and backside of the boards are covered in black felt to protect your desk or bookshelf surface and the books. These Bookends would be wonderful on an Executive Desk corner or tabletop by your chair.